I recently picked up the Linksys EtherFast 4-Port Cable/DSL Router for $215.00 can. I have been looking at Routers for over 6 months now and finally decided to pull the trigger. I required a Broadband Internet Connection for your typical Quake3 LAN games and office computers. After setting up the Linksys EtherFast 4-Port Cable/DSL Router I was totally satisfied with my purchase. Please read on. 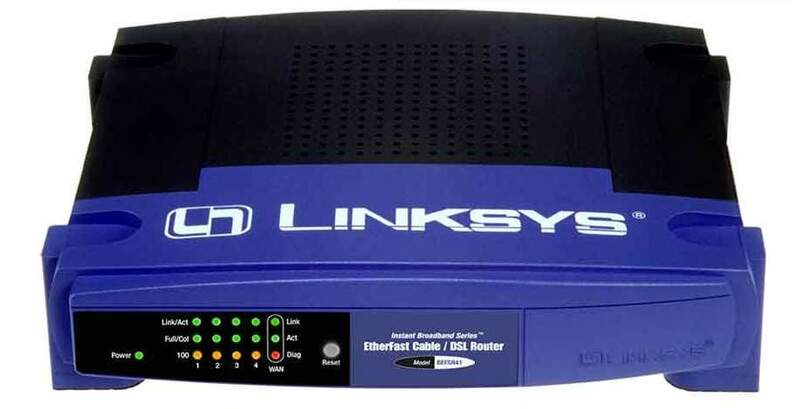 A Linksys EtherFast 4-Port Cable/DSL Router is an Internet sharing device and a lot more. It connects your WAN network to your Home network or (LAN). One of the great things is that you don’t have to pay for second IP addresses, if your ISP charges extra for this. The Linksys EtherFast 4-Port Cable/DSL Router is assigned to your IP address that your ISP gave to you and in turn the Linksys EtherFast 4-Port Cable/DSL Router assigns your LAN network there own IP addresses, Up to 253 PCs can be connected using the one IP address and each PC assigned its own IP address by the Linksys EtherFast 4-Port Cable/DSL Router. Page 2: What comes in the box?